While prenatal vitamins are designed for pregnant women and those trying to conceive, the supplements contain important vitamins and nutrients that may be helpful to some men. Men may benefit from a regular multivitamin supplement, but the levels of some nutrients in prenatal vitamins may cause problems for a proportion of the male population. However, prenatal vitamins may aid men with low levels or deficiencies of certain nutrients. Discuss the potential benefits and risks of taking prenatal vitamins with your doctor before taking them. Calcium keeps bones strong and healthy, a significant consideration for women due to the risk they face of osteoporosis. Calcium is important to men as well. Prenatal vitamins typically include 200 to 300 mg of calcium, which helps men and women meet their recommended daily intake. Men up to age 71 should aim for at least 1,000 mg of calcium per day between supplements and dietary sources. After 71, 1,200 mg per day is the minimum recommended amount. However, men taking calcium supplements might also be risking their cardiovascular health, because calcium supplements are linked to cardiovascular disease, according to Harvard Health Publications. Prenatal vitamins often contain more iron than do other multivitamin supplements because pregnant women require more iron to support the fetus. Men only need about 8 mg of iron per day, while pregnant women need 27 mg. The iron content of a prenatal vitamin may be too high for most men and can lead to gastrointestinal problems, liver problems and dangerously low blood pressure. It might also cause liver damage, because excess iron is stored in the liver and may eventually accumulate to toxic levels.Men who have anemia due to heart disease, kidney problems, cancer or other medical conditions may need additional iron supplementation, and a doctor may recommend a prenatal vitamin to help in these cases. Folic acid is important for pregnant women because it helps protect the fetus against neural tube birth defects. Prenatal vitamins usually contain about 1,000 mcg of folic acid, the recommended daily amount for pregnant women. Most men do not need additional folic acid because they get enough through food sources. Their recommended daily amount is only 400 mcg. In fact, excessive folic acid can be dangerous for men. 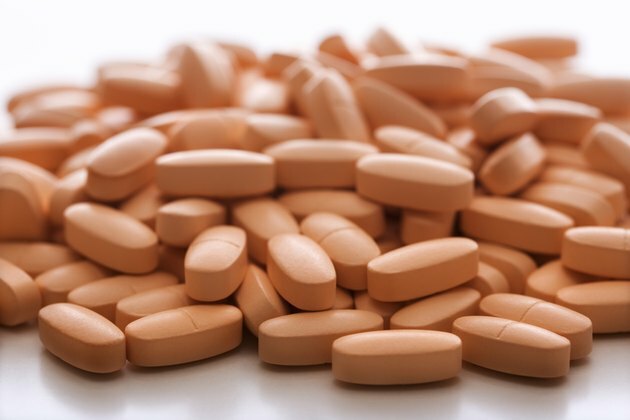 A 2009 study by researchers at the University of Southern California found that men who took a daily folic acid supplement had twice the risk of prostate cancer than did men who did not take the supplement. The few men who do not get enough folic acid in their diets may be encouraged to take a prenatal vitamin or another folic acid supplement to correct the problem. Most men simply do not need a prenatal vitamin to get the vitamins and minerals their bodies need. While a prenatal vitamin usually won't cause problems if used in a pinch when there are no other vitamins around, it's best for men to take a daily multivitamin that is formulated for all adults or one that is specifically tailored to men. Men with particular health or nutrition concerns should speak with their doctors regarding a multivitamin to determine which vitamins and minerals are most important for their needs. How Much Calcium Does a Man Need?